Most investors who are defined contribution plan participants use an outside advisor for investments beyond their retirement account funding. But they do so with specific needs they want to have addressed. According to Spectrem’s DC Participant Insight Series report Advisor Usage Among DC Plan Participants, 73 percent of DC participants use an outside advisor. They maintain control of a large portion of their investable assets themselves, but on average do turn over approximately 20 percent of their assets to the complete control of an advisor. But participants have demands of advisors beyond investing advice. 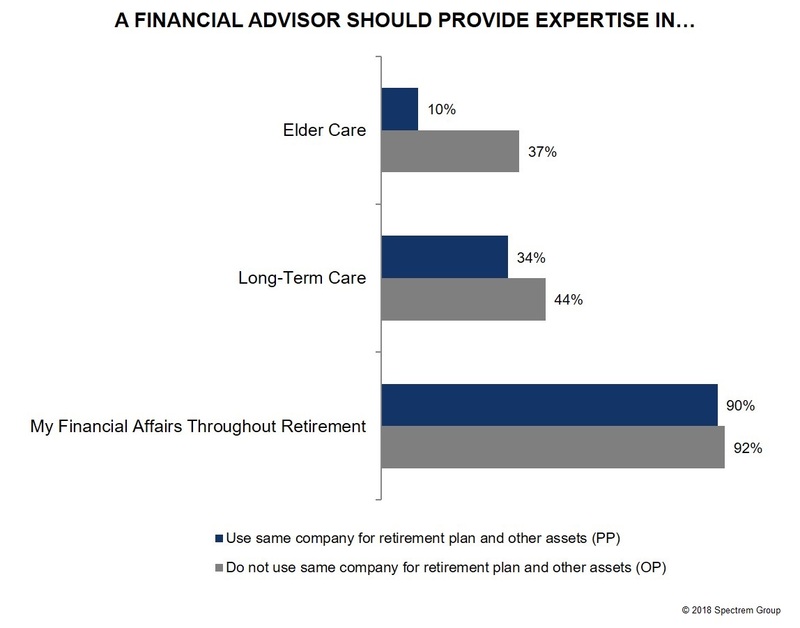 Ninety percent of plan participants believe their advisor should provide expertise in financial affairs throughout retirement, not just up to the day of retirement. Forty-one percent believe advisors should provide expertise regarding Long-Term Care, even though health insurance coverage for Long-Term Care is not a product many advisors may offer themselves. Of even less profitability for advisors is the topic of Elder Care, in which investors need assistance doing what needs to be done for their parents as they require special needs in their later years. Twenty-seven percent of plan participants expect their outside advisors to provide that sort of expertise. Do all of those expectations meet with the type of advisors plan participants prefer? Thirty percent of plan participants use a mutual fund representative, perhaps from their 401(k) provider, as their primary advisor, and 21 percent use an Independent Financial Planner as their primary financial professional. Advisors need to have conversations with their clients about their expectations related to matters which do not necessarily provide for profitable products for the advisor. Asked to list their No. 1 characteristic for choosing a new advisor, the highest percentage (24 percent) said the advisor should be aligned with a well-known brand or company. That was higher than the 21 percent who said a new advisor should be perceived as being honest and trustworthy, which is often the No. 1 choice among affluent investors. The Spectrem study asked plan participants to indicate which services they have already received from their primary advisor, which services they have received from someone other than their primary advisor, and which ones they are going to pursue in the future. For example, 51 percent of plan participants have a written financial plan provided by their primary advisor, while 21 percent plan to acquire a written financial plan at some time in the future. Advisors might wonder why these clients are waiting to pursue a written financial plan. Ask your clients who participate in DC plans if they are interested in a detailed list of future investment concerns and solutions. Only 28 percent of plan participants have spoken to their advisor about long-term care, but 42 percent plan to have that conversation in the future. Again, what are they waiting for? Many plan participants expect their advisor to be able to handle that conversation. Only 18 percent of plan participants have spoken to their primary advisor about an estate plan, and the percentage only reaches 28 percent among those participants between the ages of 50-64. A huge percentage of participants report they plan to develop an estate plan in the future, but just because the decisions go into effect down the line does not mean investigating those decisions should wait. Considering that DC plan participants have already given some thought to funding their retirement, it is interesting that only 55 percent have discussed retirement planning with their advisor. Almost 20 percent plan to have that conversation in the future, but any advisor will tell you that retirement planning does not improve the longer you wait. Investors with DC plans are obviously considerate of their financial needs in the future, and many are on the lookout for advisors outside their DC plan provider to assist in planning other investments. This is a market of investors who will need assistance when retirement rolls around to determine the best way to handle their possible rollover of their retirement fund and eventual disbursement of those funds. Advertising to DC plan participants is not a waste of time.